Imagine being a teenager and having to move alone to a far-away country just to find work. Then finding the work is back-breaking, extremely dangerous and poorly paid. Yet within the squalid conditions, you find camaraderie, even love. This is the story of two young men, Mateo and Henry. Although they didn’t even share a language, they forged a bond when they endured landslides, diseases and other adversities in the Panama jungle in the early 1900s as they and thousands of other itinerant workers toiled to demolish a path through a mountain range to connect two oceans. The Panama Canal is considered to be a feat of engineering. But the human cost was very high, as more than 5600 lives were lost during construction. 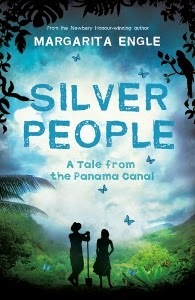 Silver People tells the story of Engle’s ancestors who were amongst the thousands who suffered the harsh conditions. Told in verse from multiple points of view, it also recounts the growing relationship between the sensitive Mateo and the indigenous herb seller, Anita. The narrative is also interspersed with the indignant voices of the howler monkeys, jaguars and other animals who lost their niches as the jungle was sacrificed. It also includes snippets from official documents of the leaders, confirming that they simply did not care how many lives were lost, as long as the project was completed. The story gets its title from the two-tiered wage system; white people were paid in gold, dark skinned in silver. Overall, this is a story of love and endurance of the human spirit, and ultimately an uplifting read.